Heat oven to 450°F. Line 17x12-inch half-sheet pan with foil. Bake potato nuggets as directed on package. 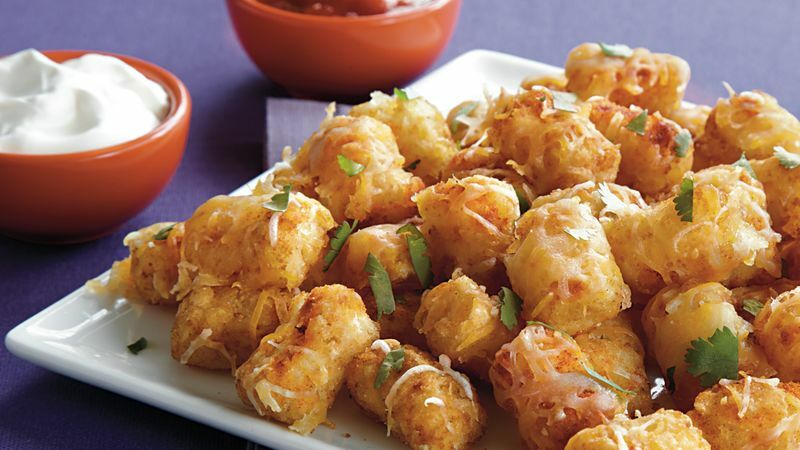 Sprinkle potato nuggets with taco seasoning mix; toss to coat. Sprinkle with cheese. Bake 2 minutes longer or until cheese is melted. Use foil to lift nachos to serving platter. Sprinkle with cilantro. Serve immediately with salsa and sour cream. Use toothpicks, if desired. To make these nachos as an individual serving for an after-school snack, bake 1 serving of potato nuggets and top with a few tablespoons of cheese and salsa.